Every year around this time we start our gardening by a sunny window. I love the fact that it doesn’t matter how much space we have, or even if we don’t have any outdoor space at all, we always have room for a bit of greenery grown from seed. This year, we are extraordinarily lucky to have a yard where we will set up a sweet-pea teepee that the kids will be able to hide in, read their books, and dream the summer hours away. 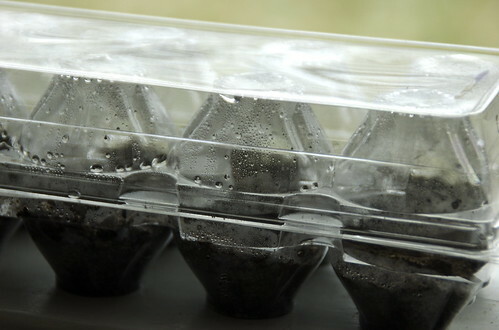 To start your own window-sill greenhouse, all you’ll need is a plastic egg carton (as pictured), potting soil, and seeds. If you have a bit more space you can use an apple carton as we did last year. Just have your child fill each well with soil, plant the seeds following the directions on the packet, give it a light misting of water and you’re done. Close the carton and let the sun do it’s thing. What kinds of seeds did you plant? Sweet-peas to make a teepee, and lavender. It’s going to smell good ’round here!